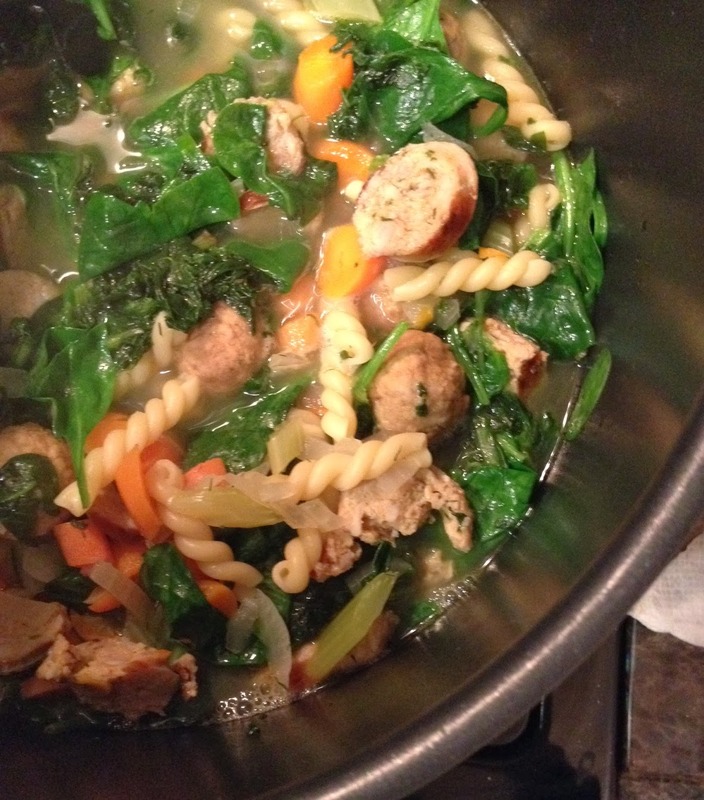 Girl Versus Kitchen: Semi-Homemade (AKA Fast and Easy) Italian Wedding Soup. 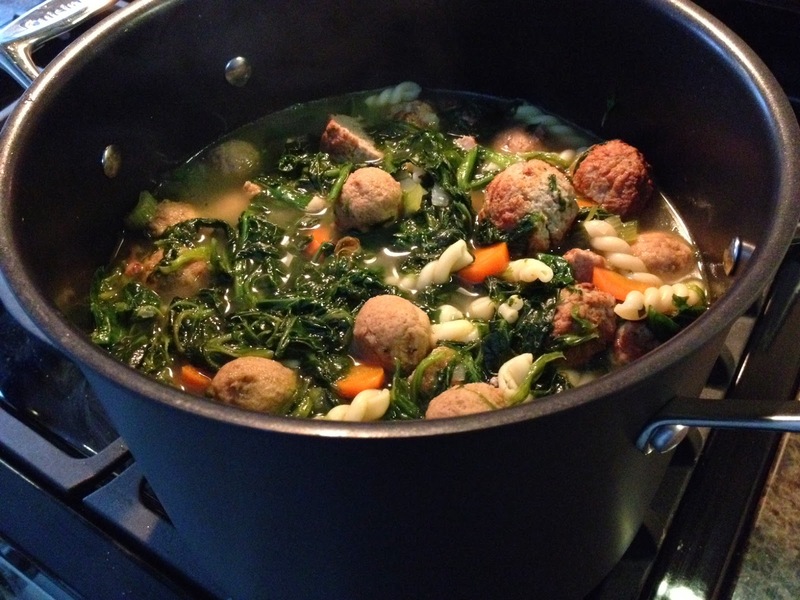 Semi-Homemade (AKA Fast and Easy) Italian Wedding Soup. Um, brrrr. It's snowstorm number 497 of this winter. We've all said it: We've had enough. 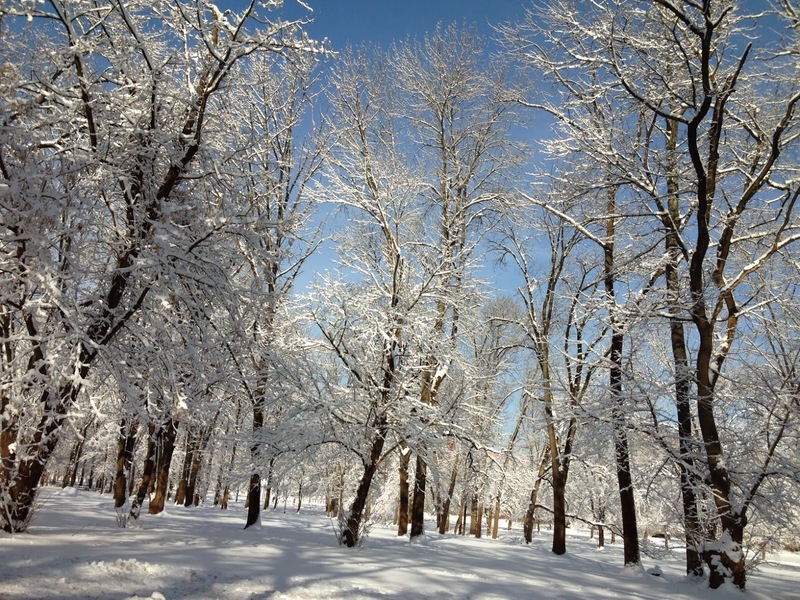 I did have to admit, waking up this morning, I romanticized the snowfall a bit. There's something just really nice about awakening in a snuggly bed to the purity outside; the stillness paired with the glittery detail is something not easily sound elsewhere. 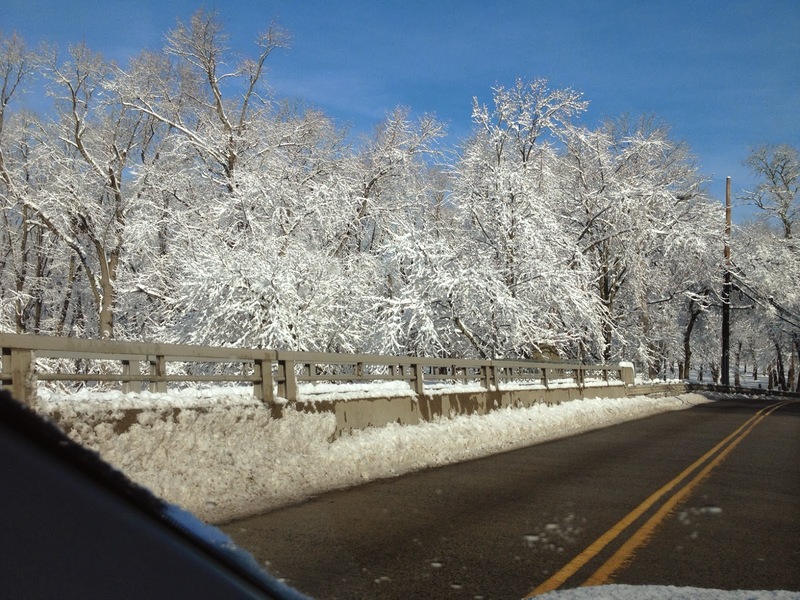 These pictures were taken on my way to work last week the morning after the last snowstorm we had. This is the kind of snowfall I mean. Pretty. Still. Romantic. So about 10 minutes into today's snowstorm - into which I only stepped out ONCE - I am totally over it. It's cold and windy and plain awful. Cold and rain and ick. Done. Figured today was just a good a day as any for piping hot soup. And definitely not the watered-down stuff you find in a can. 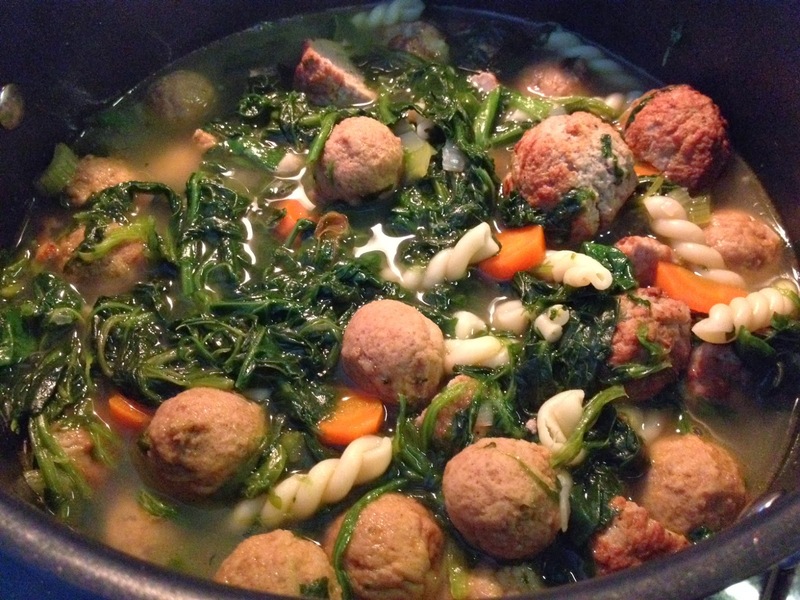 This is a rip-off from Ina Garten's already incredibly-easy Italian Wedding Soup (link). However, she makes her own meatballs for it. If I made the time, I'm sure I could do the same and they'd be amazing. However, when I'm hungry, things have to be ready ASAP. I definitely recommend checking out the Barefoot Contessa's soup recipe for some really great-sounding, truly homemade chicken meatballs. I can't vouch for them because I've never had them, but they sure sound good. 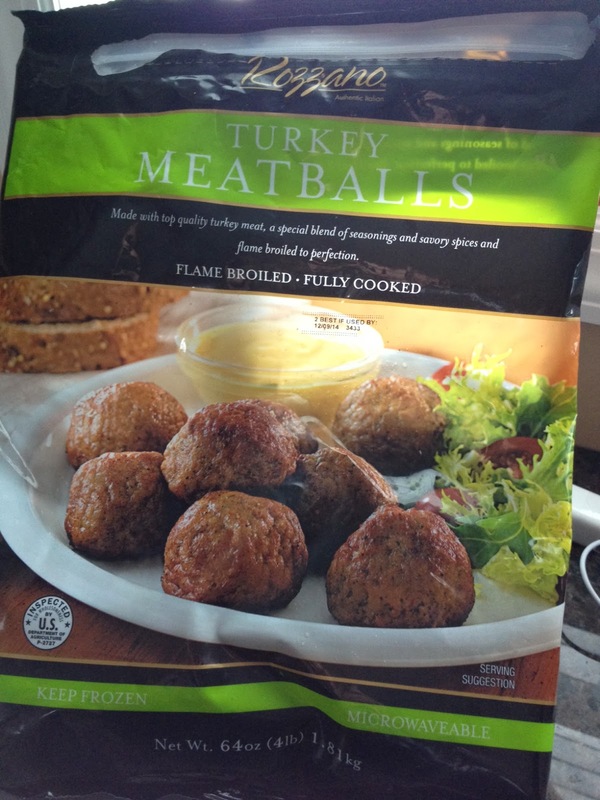 Instead, I used these store-bought turkey meatballs, from BJ's (thanks M! ), and cut them in half because they're really huge .. and frozen spinach. Yes, I know. 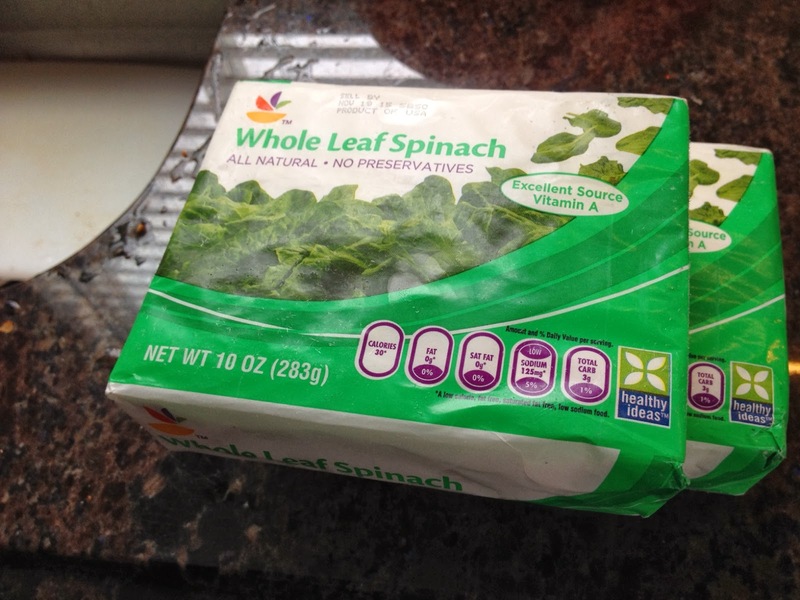 Trust me, it's okay: it's SUPER cheap, convenient, quick, and just as good in soup as fresh spinach is. The big selling point of my soup over Ina's? This should take less than a half-hour to cook - probably even 20 minutes. Compare that to the one-hour, fifteen minutes of prep time Ina's takes! And it tastes fully homemade (You do have the option of leaving the meatballs whole - adds to the authenticity of the "homemade" feel). It's SO fulfilling, and it freezes well. I even made another pot of it for E's neighbors - it was very well received! 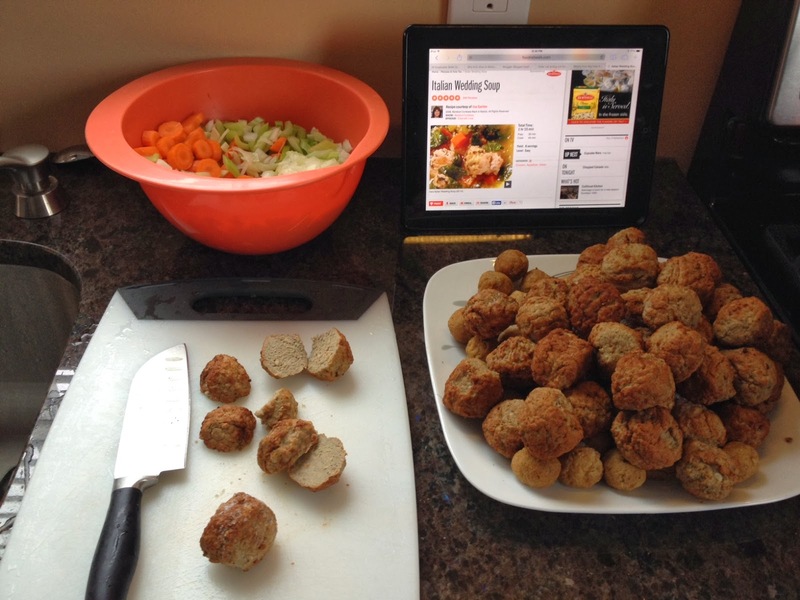 1 lb pre-cooked frozen turkey meatballs (OR: 1/2 lb frozen turkey meatballs, 1/2 lb hot chicken sausage or hot turkey sausage, cooked and cut into bite-size pieces. This obviously is a variation, and therefore kinda throws the tradition of MEATBALLS ONLY! out the window - along with the time-saving piece due to cooking the sausage beforehand. However, I made it this way twice before (you'll see sausage in the very first picture on this post) and it's too friggin delicious. Worth a shot if you're feeling adventurous. 1 cup small pasta such as tubetini or stars - or, I use the pretty pasta called Gemelli that you see above. It gets way too bloated as it sits in the soup, but I don't mind. Most people would, though. Stick with the small pasta to start. Take a swig of wine out of the bottle. Yes, I do this every time I make this soup. Whatever. Take meatballs out to defrost on the counter (or nuke in the microwave in Defrost setting for a few minutes. Do not get them completely hot - just a little warm. Cut each in half if you'd like. Heat the olive oil over medium-low heat in a large heavy-bottomed soup pot. Add the onion, carrots, and celery and sauté until softened, 5 to 6 minutes, stirring occasionally. Take care not to burn the onions, as they will look odd as little brown specks in your soup. Tip: What I do here is take the lid off the large soup pot (now that I got the broth boiling and the pasta's in there) and put it on top of the plate of meatballs. The heated lid steams up the meatballs just the slightest bit more. Add the dill and the spinach to the soup and simmer for 1 minute. Add the meatballs, and taste for salt and pepper. Cook for another three to five minutes, until the spinach is fully separated. Ladle into soup bowls and sprinkle each serving with grated Parmesan. Serve with a big piece of crusty bread. Hi! Your Italian wedding soup has been nominated as one of the "Best Italian Wedding Soup Recipes on the Net". To vote for it, please visit http://easyitalianrecipes.org/soup-recipes/best-italian-wedding-soup-recipes-on-the-net-vote-for-your-favorite/ (your recipe is positioned at #22).